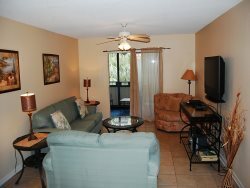 We stayed in a unit located in the rear of the property yet it was still just a short walk to the beach and local establishments. The unit had everything we needed and was more spacious than it appeared in the photos. We had a great time good weather! But there needs to be something done with the smoking area! A large family sat every day below our balcony and smoked ALL day. We couldnt sit on our balcony much in the afternoon because of it. I think the smoking should be in a designated area to insure everyone a great vacation! Extremely Helpful and Very Friendly! We LOVED our stay at Shipwatch Pointe! Thanks Grand Strand Rentals and your team for assisting us in making our vacation one we will always remember!